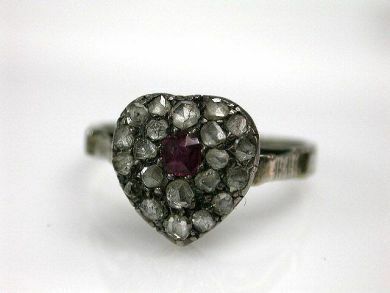 A beautiful 18kt white gold heart-shaped antique Victorian ring, circa 1880 featuring 1 ruby, est. 0.14ct and21 rose cut diamonds, est. 0.55ct (I1 clarity: I-J colour). There is minor wear under the top on the right backside.